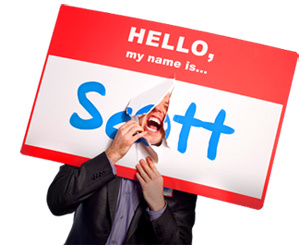 How to Make a Name for Yourself - Even if You Make a Fool of Yourself - HELLO, my name is Scott! 1. Advance confidently in the direction of your dreams. Progressing towards anything else – graceful as you may look doing so – is a total waste of time, money and energy. Either relentlessly pursue the visions that possess you or go home. What continually deflects you from your certainty of purpose? 2. Ambition always looks good on you. Plus, it vortexes people in. It inspires and challenges people to think about their own ambition. Which fills them with the fuel of passion to guide their actions. What outer skin are you wearing? 3. Arise with firm determination. Build your life in a way that makes you hate sleeping. Not because you’re workaholic. Not because you’re an insomniac. But because the passion flows out of your body so abundantly that you couldn’t use an alarm clock if you wanted to. As U.S Anderson said in his obscure book, The Magic in your Mind, “Worlds are never conquered by men who lie abed, only by those who are out in the world and doing.” Why do you get out of bed every day? 4. Be not self-satisfied with past glory. Don’t allow the arrogance of past success prevent you from learning, growing or soaring. As my friend David Newman says, “Stop measuring all situations by your glorious past rather than looking for new opportunities and the possibilities of the future.” Remember: The past isn’t just over – it’s overrated. What have you done TODAY? 5. Be scary good. There’s a good goal for ya. To be so good at what you do that people watch with breathless interested and jaws agape, thinking to themselves, “Dude, it is SCARY how good this guy is.” So, not scary in a bad way. Scary because they’d hate to be up against you. Scary because they wonder if you’re actually an alien. And scary because they KNOW you’re going to blow everyone else out of the water. What level of good are you? 6. Become the person you most admire. Wouldn’t that rock? If you could look up to yourself? If you could inspire yourself? I think so. 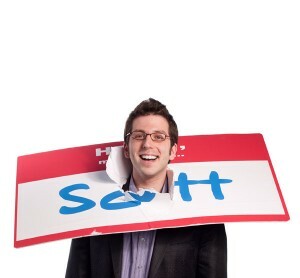 And I don’t mean that in a self-absorbed, egomaniacal, Steven Colbert kind of way. Just a deep love for yourself and a deep desire to become yourself. Whom do you admire? 7. Decide what security looks like to you. In the aforementioned The Magic in Your Mind, U.S. Anderson also said, “The only real security a man can have in this world is a reserve of knowledge, experience and ability.” Remember: Fickleness is a fact of life. How are you restocking YOUR reserve? 8. Don’t believe the dreams they pump you full of, and you won’t get hurt. That was the advice from Atlas Shrugged. And I agree. Part of making a name for yourself is deciding whom to listen to. Refusing to become limited by the thoughts others have tried to set in motion for you. Ignoring the would-be deflectors of your one true dream. Personally amputate anyone who doesn’t believe in or support your personal vision. Whose life are you living, really? 9. Failure IS an option – not learning from that failure isn’t. After all, we learn not from our experience, but from intelligent reflection upon those experiences. So, the secret is creating a system for learning and growing from everything. The secret is accepting influence from everybody you encounter. And te secret is enabling value to be added to yourself by anything, anytime, anywhere. Failed at anything today yet? 10. Find a way to insert your entire self into it. Whatever “it” is. Your job. Your role. Your assignment. You phone calls. You conversations. Your presentations. Whatever. The secret is bringing more of yourself to everything. The secret is asking the question, “What would I do in this situation?” Which reminds me of what my mentor once said, “The more that it is YOU, the easier it will be to do.” How much of YOU are you putting into this moment? Are you willing to make a name for yourself even if you make a fool of yourself? For the list called, “19 Way to be the ONE Person Everybody Remembers at the Conference,” send an email to me, and you win the list for free!